Announcing Life Skills, a new programme to help you challenge unhelpful thinking and behaviour and make positive changes in your life. Life Skills is a programme of six 90-minute psychoeducational classes held at locations in Ashford, Tonbridge, Tunbridge Wells and Sevenoaks. Courses in Edenbridge and Paddock Wood will also be scheduled. Coping with Depression is a Mind registered course that runs for 5 weeks and helps participant’s to understand the signs of depression and the affects that it has upon them. Through use of Cognitive Behaviour Coaching you gain strategies and techniques to aid recovery from periods of depression and build resilience against developing future episodes of depression. Understand stress and anxiety, physical symptoms and triggers, Learn CBT basics, Awareness of unhelpful thinking patterns, feelings and behaviours associated with anxiety, Examine anxious behaviours in particular ‘safety’ & ‘avoidance’, Plans for sustained recovery and dealing with relapse. The peer led programmes are suitable for anyone who would like to and is able to engage in a group activity. The actual projects will be decided with the group once they start to try to match the project to the skills, interests of the group etc.… An example of a project: Art in Mind – aims to develop and deliver an art exhibition. Type of activities – introduction to art and group discussion, creating art works, planning exhibition, assigning tasks e.g. venue, invitations ends with an art exhibition. Groups are facilitated by a Wellbeing Project Worker and supported by Peer Volunteers. People can start at any time.Click and Walk, Community Nature and Eco Therapy, Music for Wellbeing, Make friends with a book. Organised activity based on growing of organic fruit and vegetables, dependent on produce available. You will cook a simple healthy main meal, working with our chef and/or assistant chef using food from the Market Garden. Learning the benefits of providings a garden that is a place for birds, bugs and wildlife to include doing an activity in the garden. It is a dependent on group interests which will be indentified in initial meeting. You can take part in some or all of the Field Trail around Bore Place, led by a member of the Bore Place staff (approximately 2.5 miles). Learn to cook nutritious meals on a budget alongside food safety and hygiene. Set in our organic vegetable, fruit and flower garden. Develop skills for your own outside space and get fitter too whilst you interact with nature. Baking artisan bread in our bakery you’ll learn how to create bread and dough products for sale in our café and for our customers. Come and join our therapeutic stained glass course where you will learn to safely design, cut and solder artwork for sale to customers. Improve your creativity and dexterity by learning techniques with paper, paint, pastels, felt and create items for sale. This will run over 12 sessions – starting on 10th April with the 1st Session being a presentation and ‘ Ideas Gathering’ This is an opportunity to produce art work, with a theme of ‘Do not Judge’ supported by a volunteer and staff, that will lead to an exhibition finale – to showcase people’s creativity and expression. Self-help support group, facilitated by a person with lived experience. The group shares information, experience and self-management techniques in a confidential and supportive environment. Helps people living with Bi-polar manage their long-term condition. This group is suitable for people who experience things differently from others e.g. hearing, seeing, feeling, tasting or smelling something that others do not and may also include people living with distressing beliefs. All groups are run by an experienced Wellbeing Project Worker assisted by skilled volunteers and occasional guest speakers for additional expertise. Creative Minds includes: Visual arts, introduction to crafts, make friends with a book, drama, dance and wellbeing though music. Visual arts, introduction to crafts, make friends with a book, drama, dance and well-being through music. Gardening, wildlife walks, birdwatching, foraging and wildlife photography. Healthy eating, cookery, mood and food, walking/running, sports awareness and relaxation techniques. Join us to help prepare and enjoy a nutritious lunch with staff, volunteers and peer support. Enjoy sharing experiences and making friends in a supportive environment. Enjoy working on your own project, learning sewing, knitting and crochet skills in a supportive environment. Walk and talk: Enjoy fresh air, exercise and peer support in Tunbridge Wells and the beautiful West Kent countryside. Itinerary set each month. An informal group – the group will choose a book to read or film to watch and then meet to discuss and explore ideas in a supportive atmosphere. General social support and Art and Craft sessions. Pop in for a cuppa and/or work on craft projects. Materials provided. Meet staff, volunteers and staff and enjoy sharing experiences and making friends in a supportive environment. The Mindful Social group offers you a chance to relax and be with your peers in a safe environment with refreshments provided and a wellbeing worker offering information and support. We also provide mindful activities including a weekly quiz for everyone to take part in to help keep our minds active and engaged. Based on the Couch to 5K basic training programme our Running group aims to get novice runners to a 5k standard through a twelve week programme. Facilitated by a qualified sports coach, who has represented GB in Triathlons this group offers a friendly way to improve both your physical and mental health. Ieso (Psychology Online) info@iesohealth.com (opens in new tab or window) or call 01954 230066. Insight Healthcare kent@insighthealthcare.org (opens in new tab or window) or call 0300 555 5555. KMPT Primary Care Psychological Therapies www.kmpt.nhs.uk (opens in new tab or window) or call 0800 279 9500. Sleepstation – Help for Insomnia or Anxiety support@sleepstation.org (opens in new tab or window) or call 0845 260 6106. 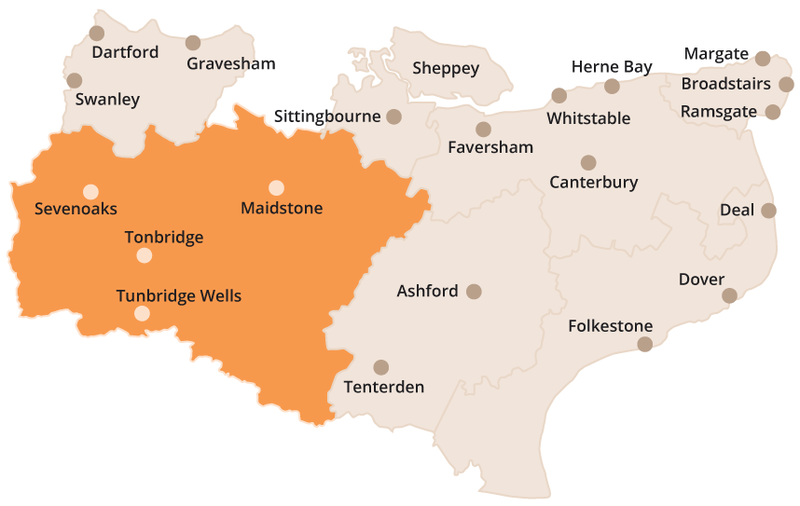 The Maidstone CMHT provides services to adults of working age with moderate to severe mental health problems or needs. Service users are normally referred by their GP but they also accept referrals from other agencies and professionals. They offer a duty service during opening hours to give advice, guidance and support to those with mental health needs.